Have you ever seen an eagle's nest? 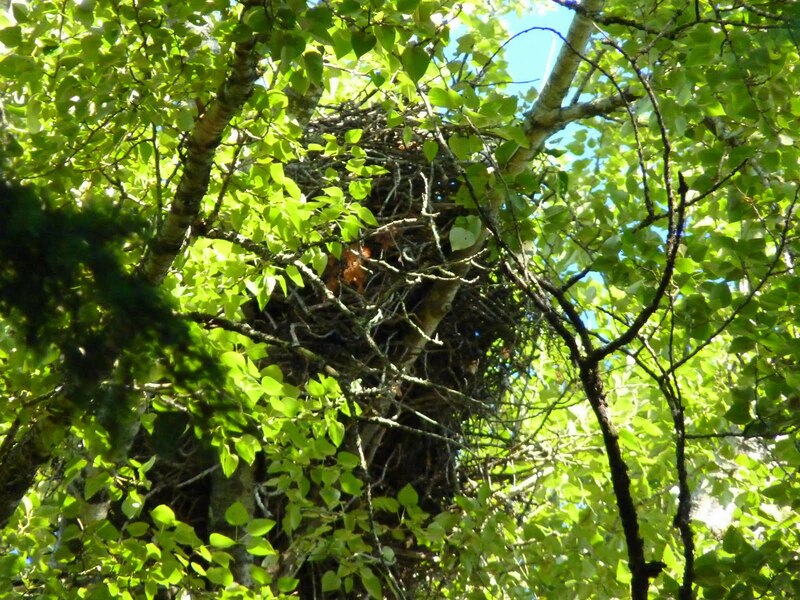 One of the most popular stops on the BCFDC's nature tours is the Bald Eagle's nest. The eagles have built a nest in a Black Cottonwood tree near North Cowichan Station (on the lower grounds). We believe there are two other nests at the museum including one in a tall Douglas-fir on the South Foresters Walk and the other in a Douglas-fir near the rail shop. Both nests are nearly impossible to see, but the eagles are regularly seen and heard in these areas. Bald eagles build some of the biggest nests in the world. One nest in Florida was 6.1 meters deep, 2.9 meters wide, and weighed 2,722 kg (almost 3 tons)! So where do Bald eagles get the sticks for these massive nests? They pick them up off the ground and sometimes they even break some off the trees themselves. Bald eagles often build their nests near bodies of water so they can remain near their food source. The BCFDC nest overlooks Somenos Lake and the eagles are often spotted with fish or ducks in their talons. Bald eagles incubate their eggs for 35 days and share the responsibility between both the male and female. Eagles mate for life and a pair will repair and reuse the same nest year after year. The best viewing spot for Bald Eagles at the BCFDC is from the base of the flag pole located on the lower grounds (beside the distinctive log Wellburn Building). If you look South towards the railway tracks, you will spot the large mass of branches and sticks among the Cottonwood trees. The best viewing time is during spring when the trees have few leaves. Most years, eaglets hatch in late June or early July. They often learn how to fly by going from tree top to tree top in the lower grounds. Even if you don't see the eagles, their distinctive calls can be heard all over the site. The Bald Eagle's nest is a must-see on your next trip to the museum!